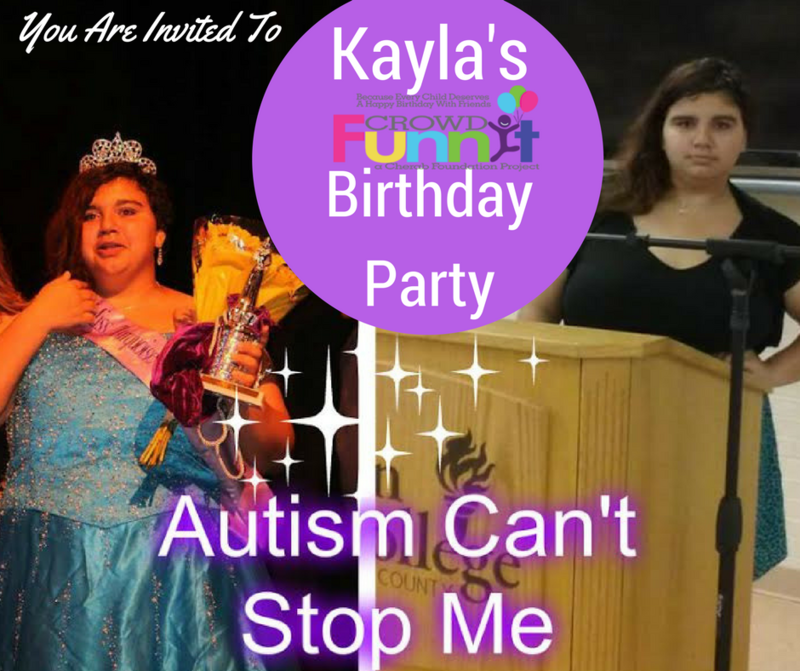 It’s not easy to feel isolated in the world when you just want to have friends you can go to the mall with like others your age, so Kayla Baylor has dedicated her 17th birthday party as a salute to end bullying and alienation. As far as she is concerned, 17th birthday in, bullying and alienation out. Bikers Against Bullies will be joining crowdFunnit to support Kayla and the cause. “The bullying started early on for Kayla, and wasn’t limited to other children,” says her mom JoAnn Colaneri. “There have been teachers, neighbors, and peers who repeatedly called her names like ‘stupid’, ‘weirdo’ or ‘retarded’.” Because Kayla is biracial she’s also experienced racial bullying and alienation from those who don’t believe she’s white, or black enough. Kayla had health issues as early as 4 months old. Early seizures as the results of an unexplained breath holding issue led to the need for a pacemaker just before her 3rd birthday. At age 8 she was diagnosed with Asperger’s. Early intervention helped with some of the deficits, however, it was clear as early as age 2 that she was different than her preschool peers. While other children collected dolls, Kayla’s collection of specialists grew with each year, growing to 17 specialists including a cardiologist, pulmonologist, and neurologist. Early elementary school and special education activities provided Kayla with a social outlet, but as she aged, socialization and friendships became profoundly more difficult. Her differences put her in a unique situation where she is too high-functioning for special education but too low-functioning to be with her peers. The same conundrum follows her into sports where her love of baseball was squashed as teammates made fun of her. It’s like she’s in her own bubble. Age 13 to 17, which is hard for any teenager, has been particularly difficult for Kayla due to her unique cognitive abilities and the incessant bullying. Not only is she affected by the bullying directed towards her, but also that of a lower functioning peer in her class, who doesn’t have the cognitive ability to know kids are bullying her. The combination of it all is tearing Kayla apart. The stress and depression became so intense that her family had her hospitalized for a week in a psychiatric unit. “I can’t handle being different and I can’t handle being by myself in life. I just want to be a normal person. I don’t fit in. I don’t belong,” she tells her mother when she’s at her lowest. From comments on social media, taunts from school peers, sneering school administers who call child protective services to her house each time her mother calls to report school bullying and neighbors who physically accost her, Kayla’s faith in society is waning. While other teens she volunteers with at the Ronald McDonald House discuss fashion trends, her attempts as a 16-year-old to join the conversation include her favorites, Clifford the Big Red Dog and Barney. We can all image just how this plays out. Most recently the anxiety has gotten so bad that Kayla often vomits before leaving the house, and in addition, she has had an increase of anxiety-based pseudo seizures so severe that she landed her back in the hospital. Kayla is fully and painfully aware that she has a difficult time bonding with peers. She finds solace in the company of her little sister Brianna, her big brother Russell, and her service dog, Abby, who is currently battling cancer. Pouring through her headphones are tunes from Old School Motown to Michael Jackson; country music favorites Toby Keith and Luke Bryan, to the dark side of life including Black Veil Bride and Avenged Sevenfold. The bullying at school is to such an extreme that it is now written into her Independent Education Program (IEP) that she be permitted to don her headphones whenever necessary while on campus to ease the anxiety from all the taunting. Kayla likes to say,” Everyone is unique. You have to take your own individual talents and run with them.” It’s a reminder to herself but doesn’t make life any easier, or make her any less lonely. However many times Kayla has been knocked down, with the help of her family and doctors, she rises up again. One avenue of strength is her participation in pageants which offer women with disabilities the opportunity to reach their fullest potential. Miss Amazing, Precious Gem Mentor and Pure International are just a few in which she can be seen raising her own crown against bullying. She’s an advocate for autism, special needs and suicide prevention, as she is no a stranger to any of these groups. While she loves to help others, she also wants the simple joys of childhood for herself. “I want to go to a sleepover. I’m never going to know what it’s like to go to the prom or what it’s like to hang out with a bunch of friends,” she tells her mom. Kayla is on cloud 9 about her crowdFunnit party – not just because it’s a party for her, but because of the anti-bullying message being sent out to the community. The potential her crowdFunnit birthday party will have on her community, bringing together individuals who will accept her for who she is, thrills her. Equally important to her is her hope that this party will bring awareness to bystanders who generally stand idle who will instead choose to step in to help protect her and others from bullying. Beyond her 17th birthday and hopefully finding friends that love and accept her for who she is, Kayla hopes to realize her dream of going to college to either become a special needs advocate or a pediatric nurse. crowdFunnit Crowd-Sources Special Events For Special Kids: crowdFunnit, a project of the 501(c)3 nonprofit Cherab Foundation, was created to bring people together, raising awareness about differences while fostering acceptance and compassion. Helping a friendless child celebrate a birthday is just an incredible mechanism in which to help make this happen. The party itself and any media attention it brings will help fight bullying at the root while the community connections will exist long after the party ends.